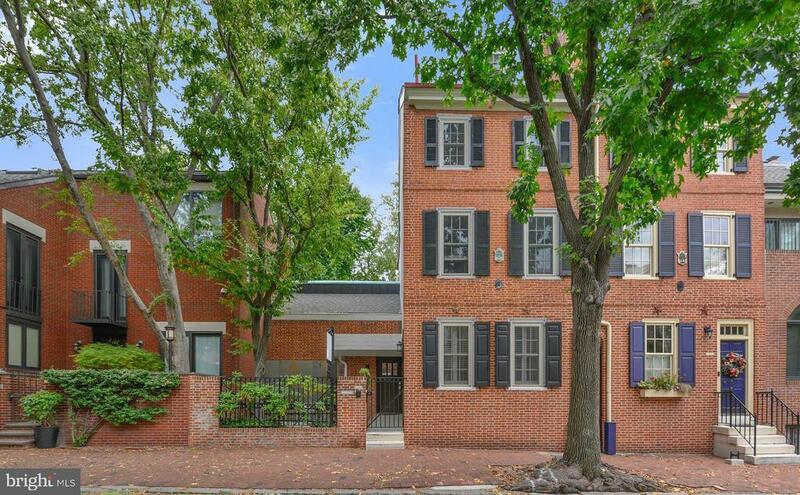 Light-filled Society Hill home with dramatic living space and an amazing double-wide brick patio and garden. Over 35 feet wide. Garage Parking with secure access literally right across the street (gated, landscaped entrance to the 410 S Front Garage, where you own the perpetual license to a designated, secure garage space). 4 bedrooms plus family room, office, and den (yes, all three), 3.5 baths. Finished Lower Level. Come see a historic c.1807 townhome combined on a double-lot with a spectacular double-height living room--20-foot cathedral ceiling with ladder-formation sky-light, which spans the entire length of this 184" x 255" room. And this great room overlooks a 35 x 35 impeccably landscaped garden with areas for entertaining and real relaxation. Just Truly Dramatic Space. Hardwood floors and flexible and open space throughout. So thoughtfully designed. Spectacular lighting as well. 109-11 Pine is a bright and stunning home on a quiet tree-lined Society Hill block. One block from the Headhouse Farmers~ Market, so many great restaurants, and close to all that Society Hill, Old City, Penns Landing, Queen Village, and all of Center City has to offer. Note: Garage Space No. 33 is a prime space in the 410 at Society Hill Garage. The space is several spots down from the landscaped, secure entrance area, which is just feet from the home. The owners purchased the perpetual license for this garage space, and it is included with the sale of the home. Easy in and out. The maintenance fee for the garage space is $47/month. McCall School Catchment. Notes: The architecturally designed, Finished Lower Level offers natural light, nice ceiling height, and includes one bedroom (with southern light and closet) a full bath, and an awesome family room with egress to the secure rear yard (included in the sq ft). Two zone central air. Four zone high-efficiency heat.